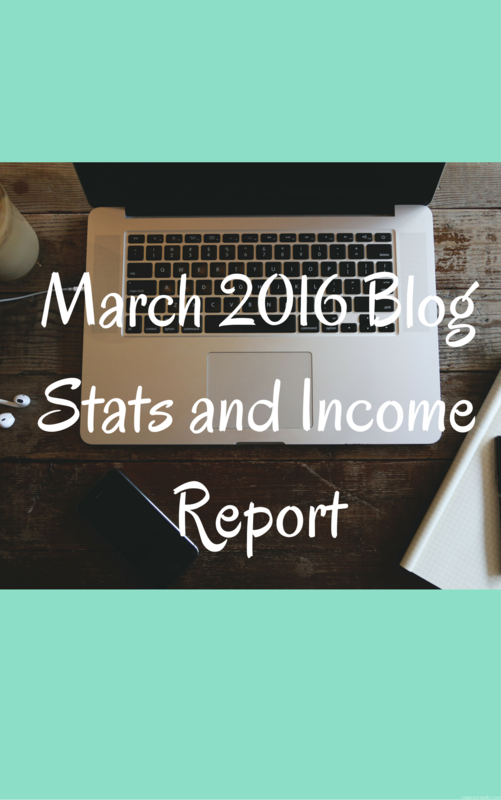 Welcome to my monthly series where I share my blog stats and income with you. I was inspired to do this because I know of some bigger bloggers (like Pinch of Yum) who share their blog stats and income but I really didn’t see any smaller bloggers (like me! and maybe you!) who do so. I figured if I was looking for something like this, others might be as well, so I decided that I’d start sharing my monthly stats and income. Here’s my March blog stats and income report – I hope you find this helpful (you can find February’s report here)! Remember that I’m utilizing a new ad network (The Blogger Network) so my ad income now comes from TBN and BlogHer. I will probably drop BlogHer and just run with TBN in a couple of months, but I’m not decided yet on that. I’m super pleased with how TBN is performing so far in terms of ad income. One neat thing is that TBN manages my ads so I don’t have to worry about any of the details. I really appreciate that since I just don’t have time to worry about ads. With how busy I’ve been, I’ve decided to do less sponsored posts. I have one on tap for later this week but that’s the only thing I have in the pike. I know that this means that my income from blogging will drop, but that’s okay. Like I said, hobby, not profession! March was slightly up in terms of pageviews from February. March was tough, as I transitioned into a new job and was getting used to my new role and figuring out how blogging plays a part of that. Why I Stopped Reading Your Blog. I love blogs but like most folks, have limited time so this post explained my mindset in why I’ve stopped reading some blogs. Shamrock Half Marathon Race Goals. It’s fun to read this post and see that I was able to set smart goals that were achievable. Thoughts on the Hanson Method Training Plan. I’ve written a bit more about the plan here in case you were curious! This past month, my top three referral sources were: 1) direct; 2) google and 3) Facebook. March was the first month in a long time that Pinterest was not a top three referral source for me. I have spent less time on Pinterest (and all social media, actually), so I am sure that had something to do with it. I’m trying to get better about scheduling my pins in bulk, which does help some! I find this interesting to read. I haven’t had that much luck with any sponsored campaigns myself. Like you mentioned, blogging for me is also a hobby not a profession so I don’t feel pressured/stressed to get campaigns…it definitely would be nice though. Thanks for sharing! Thanks for the info! My blog stats in February were so-so, but can we talk about April’s stats? Mine are way down because I’m hardly posting due to the craziness of spring. I’m hoping to get most of my outdoor spring chores finished by next week so I can get back to posting more frequently again (twice a week hasn’t been cutting it). Debbie @ Deb Runs recently posted…Painting Is A Workout, Right? I’d love to hear more about TBN! I’ve been considering switching for AGES, but wanted to hear more about others experience with them. Man, I wish Canadians had the same sponsored opportunities. We have similar pageviews, but the opportunities just aren’t the same here and it’s a bit of a bummer since I work so hard. Honestly, TBN is cool because it’s set it and forget it – they also pay out twice per month, which is really nice. I’d recommend checking out their website because they explain themselves way better than I can 🙂 But specific questions, I’ll try to answer! That’s cool that The Blog Network is working out well! I always appreciate your blog stats posts, thanks!